The anti-epileptic drug Dilantin has been linked to Stevens Johnson Syndrome (SJS) and Toxic Epidermal Necrolysis (TEN). More than 20 percent of TEN cases, which can develop from SJS, are believed to be caused by SJS Dilantin. Send your Dilantin SJS claim to a lawyer who will review your claim at NO COST or obligation. Stevens Johnson Syndrome (SJS) is a potentially deadly skin disease, usually caused by a severe allergic reaction to prescribed or over-the-counter (OTC) drugs. SJS has been linked to Dilantin, an anti-epileptic medication used to control seizures by slowing down impulses in the brain. Dilantin is one of the most commonly prescribed anti-seizure medications in the US and has been marketed by Pfizer and its predecessor companies since 1936. A study that included 15 US burn centers showed that more than 20 percent of TEN cases are believed to be caused by Dilantin, with fatalities in approximately 1 of every 4 cases. 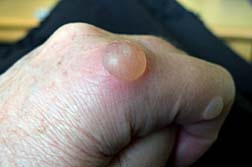 Along with SJS, other adverse drug reactions include Toxic Epidermal Necrolysis Symptoms (TEN) and Lyell's Syndrome. SJS is treated by hospitalization but most importantly, the cause must be determined first. If Dilantin is the cause, the medication must be discontinued immediately. If SJS is drug related, the chances of recovery are greatly increased once the drug is recognized. SJS can be fatal in about 15 percent of sufferers. Allergic drug reactions are a major cause of death in the United States, causing more than 100,000 deaths among patients each year. Stevens Johnson Syndrome can begin with a fever, sore throat and headache and over a few days or minutes can turn into skin lesions and blisters. Stevens Johnson Syndrome is characterized by inflammation of the mucous membranes of the mouth, throat, eyes, genital tract and intestinal tract. Ulcers inside the mouth are the most common, irritation to the throat, tongue, gums, and lips. Affected individuals may also have skin lesions, blisters and bleeding in the lips, eyes, mouth, nasal passage and genital areas. As Stevens Johnson Syndrome evolves, the skin literally sloughs off in sheets. Patients are typically treated in a hospital's burn unit. If the skin lesions become infected, or the patient develops lesions in the lungs, it can cause death. In May 2006, the parents of a nine-year-old girl who was prescribed Dilantin and later died from TEN filed a wrongful death lawsuit against Pfizer and McNeil Consumer & Specialty Pharmaceuticals. The lawsuit claimed that Pfizer had not bothered warning doctors and patients in the US of a higher risk for developing Dilantin Hypersensitivity Syndrome which can include TEN, and that "Pfizer's label does not advise clinicians that a drug-company sponsored survey of seizure clinicians concluded that Dilantin should virtually never be used as a first line anti-seizure drug for children". Following a hearing before a New York State Supreme Court Judge in October 2010, Pfizer will pay a $3.78 million settlement to the family. including the US-FDA Adverse Event Reporting System." The lawsuit further alleges that the manufacturers knew of the drugs' dangers, but failed to adequately warn, and that Pfizer (in its submission on Bextra to Health Canada) said that drugs containing Dilantin substantially increased the risk of adverse skin reactions more so than other drugs on the market. The plaintiffs are claiming strict products liability, negligence, failure to warn, negligence in bringing Dilantin to market, negligent misrepresentation, misrepresentation by omission, negligence per se, fraud and misrepresentation, fraud by concealment, violation of the Illinois Consumer Fraud Act and wrongful death. In March 2011, a lawsuit was filed against the generic makers of Dilantin-- Sun Pharmaceuticals Industries, Caraco Pharmaceutical Laboratories, Hospira, UDL Laboratories and Mylan Pharmaceuticals and their subsidiaries--claiming SJS and TEN was caused by taking the generic epilepsy drug Dilantin. Charles Henderson of Georgia took both generic Dilantin and generic fosphenytoin. Dilantin (phenytoin). The lawsuit notes that there have been more than 1,000 SJS cases from Dilantin and at least 139 deaths from SJS. Although the FDA acknowledged Dilantin' link to SJS and TENS in 2008, Henderson says there should have been more warning about the risk of getting SJS. If you or a loved one has suffered from Stevens Johnson Syndrome after taking Dilantin, please click the link below to send your complaint to a lawyer to evaluate your claim at no cost or obligation. Girl Perseveres Through Pains of Stevens John..
SJS Dilantin: "My Mother Died in Agony"
I suffered from a severe reaction which caused my head and tongue to swell and my skin on my whole body had become black which looked like I had been burned. This incident has caused me to have Steven Johnson's Syndrome and I can't take certain medications. It also caused me a lot of pain and suffering. This was the worst thing that ever happenend to me because the doctors told my family and I if they would have waited a little while longer to bring me to the hospital then I would have died. In early August my father took ill and was taken to the local hospital. While there he experienced several mild to moderate seizures and was subsequently put on Dilantin to control the seizures. My father had never had seizures before and appeared healthier and more active than most men his age. After the doctors ran several test to determine the cause of the seizures--my dad was found to have approximately four brain lesions. My father's seizures responded well to the drug for a while. However he was hospitalized again around the nineteenth of last September after suffering a substantial seizure with symptoms similar to a stroke. At that time he was placed on a higher dosage of dilantin and it was during this time that he developed SJS with burns that covered over one third of his body. His eyes, face, ears, neck, mouth, throat, chest, sides, back, and groin were all affected. My father was already ill, but when he contracted SJS he was in for the fight of his life. Also he was not immediately diagnosed and his family members had to bring the lesions to the attention of his doctors and nurses. I don't think they had ever seen a case of SJS. For several days they did nothing about his developing skin condition. During this time he continued to run a significant temperature. My dad passed away on 09-11-07. We still do not have an official cause of death. However, his external lesions/burns were beginning to heal. We were never told that SJS was a side affect of this drug. I was taken to hospital with Dilantin allergic reaction, unable to breath hives. Switched to Tegretol. However, I developed huge breakout and continue even though I am off of these drugs. I have a lesion on my lung, scarring and am having gastrointestinal problems. I also have a lesion on my kidney. I lost layers of skin, extreme pain, I thought I was going crazy, Insomnia, swelling. I was diagnosed at first with Scarlet Fever.